Huge Protest march in London for a vote Against leaving the European Union…. The people of that country have begun to have second thoughts as their lawmakers twist and turn like a pretzel trying out do each other…. It seems that the people are tired and want some normalcy back…. The prospect of a divorce has been tortious …. Tens of thousands of protesters in London set off on Saturday afternoon from Hyde Park to Parliament in a last-ditch effort to reverse Britain’s looming split from the European Union, in a sign of the enormous anger among pro-Europeans in Britain about the stalemate among lawmakers. 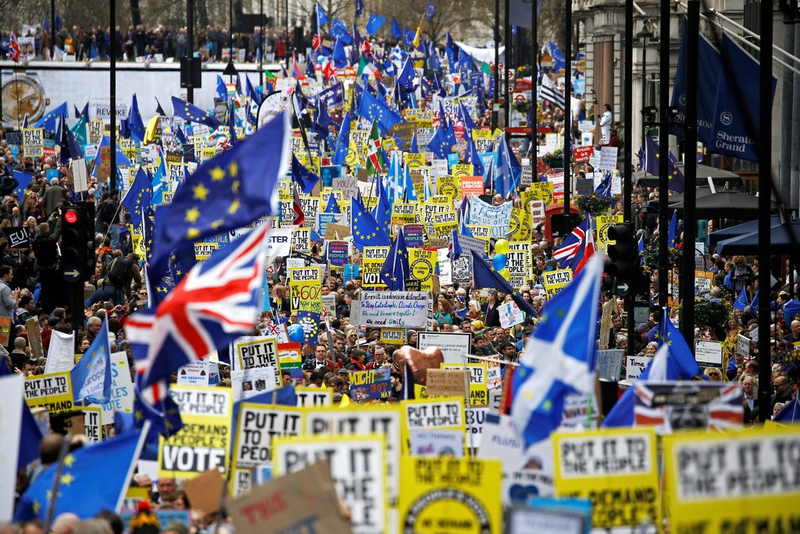 The chances that the huge crowd snaking through the streets of London, carrying placards and the European Union flag, would persuade lawmakers to back a second referendum on Britain’s withdrawal, known as Brexit, are remote. But that did not stop a petition calling to cancel Brexit from racking up more than 4.2 million on Parliament’s website on Saturday — the same day as the march. “This is the first time I’ve felt that I needed to come and take part,” said Jenny Chandler, 54, a food writer from Bristol, arriving under the Victorian arches of London’s Paddington Station before setting off on the march. Protesters around her clutched coffees and waved European Union flags, their chatter drowned out by the rumble of trains. Ms. Chandler wore a blue beret with gold stars, a nod to the European Union flag, that she had borrowed from a neighbor. The idea that the British could still be debating in late March a reversal of the coming split from the bloc once seemed far-fetched. The country had been scheduled to leave on March 29. But Parliament remains deadlocked. The left and right despise Prime Minister Theresa May’s plan. And even as deadlines were pushed back and European leaders preached patience with their counterparts in London, the prospect of a calamitous no-deal Brexit looms closer every day. The organizers of the march on Saturday say there is one way out of the impasse: Give Britons another chance to vote on whether to leave the European Union…..
MPs are expected to get the chance to hold a series of so-called indicative votes on possible alternatives to Mrs May’s withdrawal deal, but Brexit Secretary Stephen Barclay said they would “not be binding”….